bluespot City Info – What's happening on your turf? 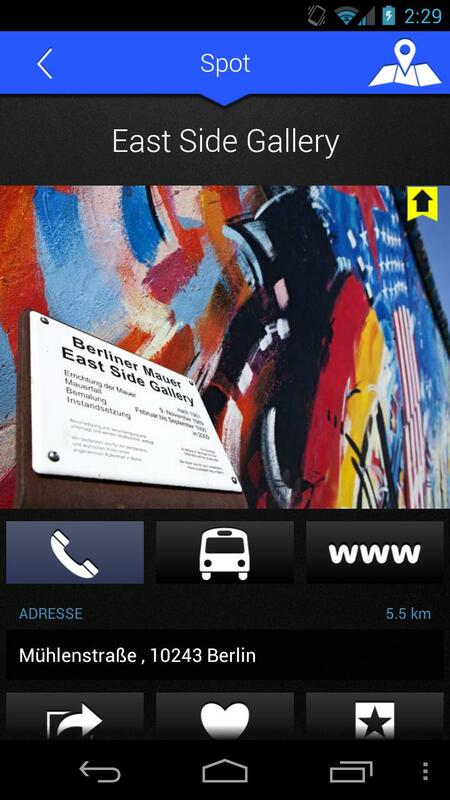 The mission of bluespot City Info from the developer Wall AG is to help you explore seven major German cities. What's new, what's hot, what's not (but worth a visit nonetheless) and most importantly: where's the grub? With the help of sharp pictures and current information, bluespot seems well equipped to act as your city guide. But does it perform as well as all that? Let's find out! 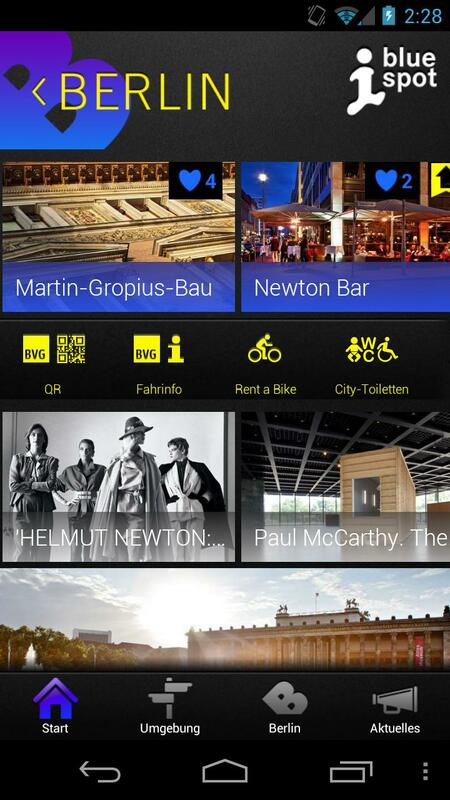 bluespot City Info is your personal city guide for the following cities in Germany: Berlin, Potsdam, Dortmund, Duesseldorf, Freiburg, Karlsruhe, Muenster. The developers have let us know that they plan to add more cities to the list in the near future. When starting up the app, select a city and you will be transported to an overview of interesting events and places as well as general infos related to your city (such as number of inhabitants and public loos). The bar below harbours the following options: Home, Around, *City* and News (though *City* will appear as the name of the city you have selected). 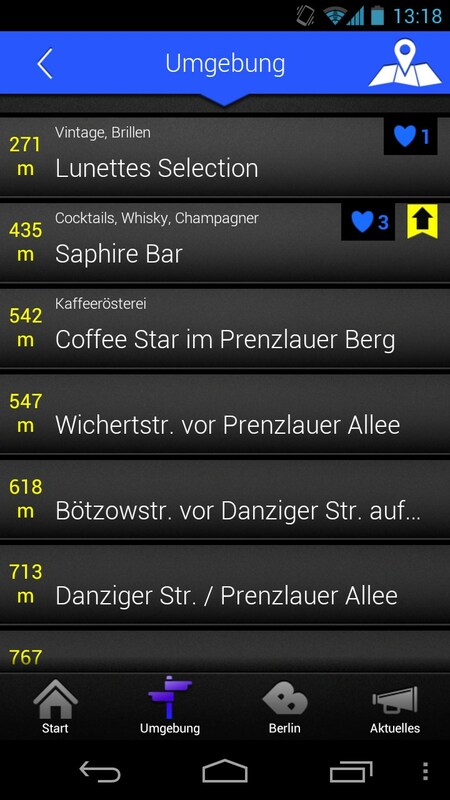 Hit the Around tab in order to check out bars, pubs, cafés, clubs and cinemas in your area. You can then hit the map icon to see exactly where a given location is situated. Select a location in order to check out a more information related to it as well as the exact address, photos, a brief description and an option to have your itinerary planned using Google Maps. The Google Maps option could do with a bit more tailoring as it currently requires a lot of clicks in order to get to the journey planner. To my liking, the itinerary planner should be just one click away. You can also share a location with others or add it to your favourites/bookmark it. The City tab harbours so-called “Spots” for your city. You can choose a category (e.g. 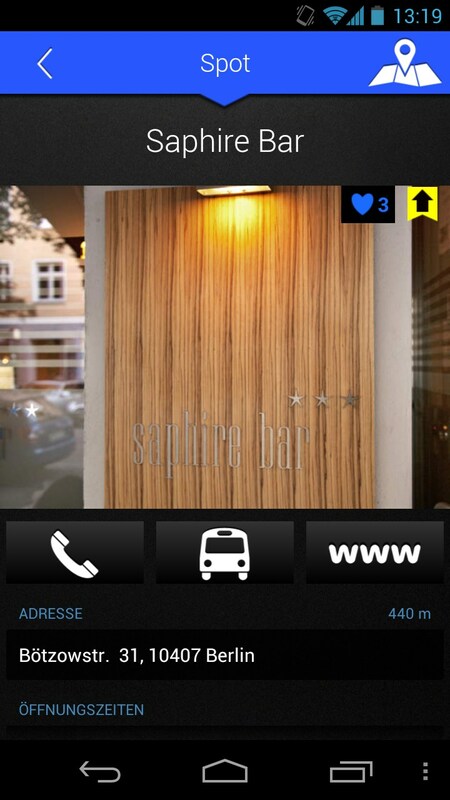 bars & pubs, attractions, architecture, shopping or hotels) and then search for a Spot within the category. The app even has a few custom tours on board to help you spontaenously plan your next pub crawl or excursion to visit a castle, ect., without having to think and plan too much beforehand. At the moment there aren't all that many tours to choose from but the ones that are there are pretty neat, so here's hoping that the list will flesh out a bit more. 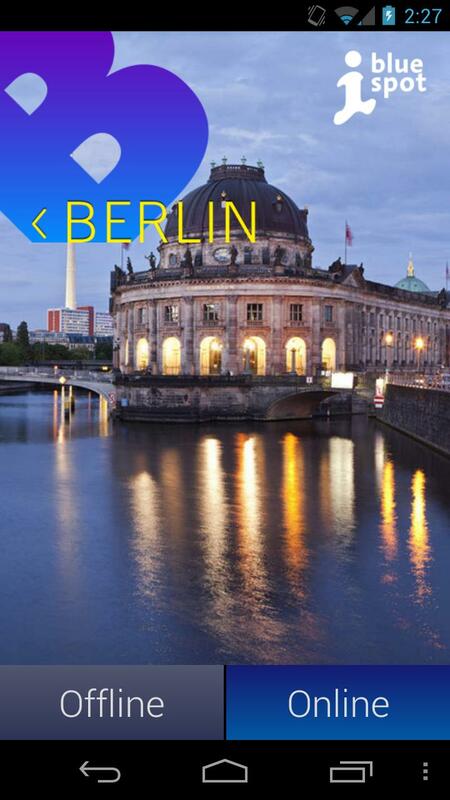 At the moment, Berlin's tours include fun options such as: "Berlin Attractions", "A Cultural Tour of Charlottenburg", "Technology and Contemporary Art in Kreuzberg" and "Space Kids Tour", amongst a few others. The News tab obviously brings you the latest news and events. This is a fun means to keep an overview of what's up and what's coming up. However, when we tested the app only three events were listed, which is a shame because I would've loved to see lots of updates related to politics and sports. The concept behind bluespot City Info is very promising indeed and we can't wait to see how the app evolves. While the app does already include sufficient “spots” and locations, the News and Tours selection could be more ample. We're awarding this app a “good” three star rating and are curious to see how it pans out in the near future. bluespot City Info is a very tailored app when it comes to visuals and graphics, and it's easy and intuitive to use to boot. The UI harbours large buttons that are difficult to miss even for users with stubbier fingers, and the design is sleek and appealing. While bluespot City Info is stabile and didn't crash at all, the controls leave much to be desired. They're not as fluid as we like them to be, and there are lots of little bumps along the way, be it when you're scrolling through news or swiping through images and lists. The application bluespot City Info is free and can be downloaded from the Google Play Store. There are additional surprise costs or ad banners. Great!